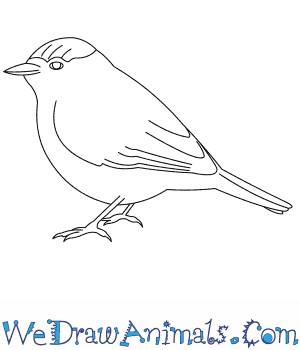 In this quick tutorial you'll learn how to draw a Blackcap in 7 easy steps - great for kids and novice artists. At the bottom you can read some interesting facts about the Blackcap. 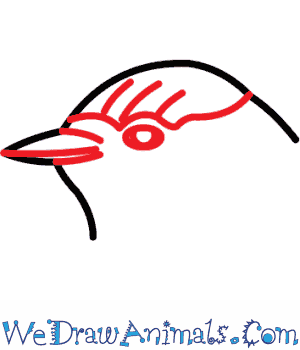 Step 1: First, draw the head with a short, thin beak in the middle. 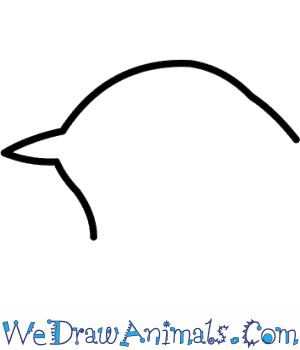 Step 3: Next, draw the plump body of the Blackcap by using one deeply curving line for the belly and one nearly straight line for the back. 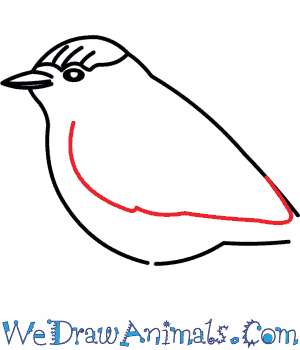 Step 4: Let your Blackcap fly by adding a curved line that begins at the chest and connects to the back line. 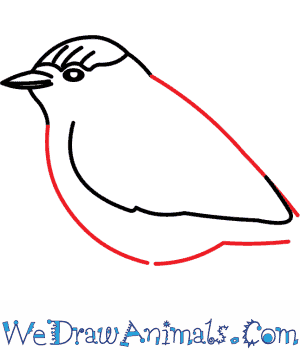 Step 5: Now, draw the short tail by drawing a rectangle that connects to the back of your bird. 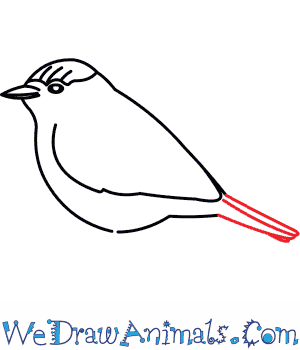 Draw a line in the center of the tail to show off your bird's feathers. 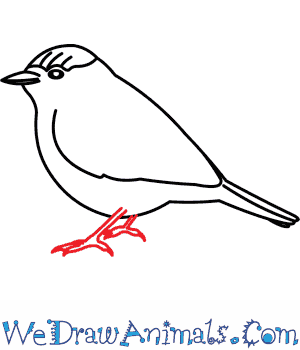 Step 6: Lastly, draw the legs and feet by connecting two thin lines to three points which are the feet of your bird. 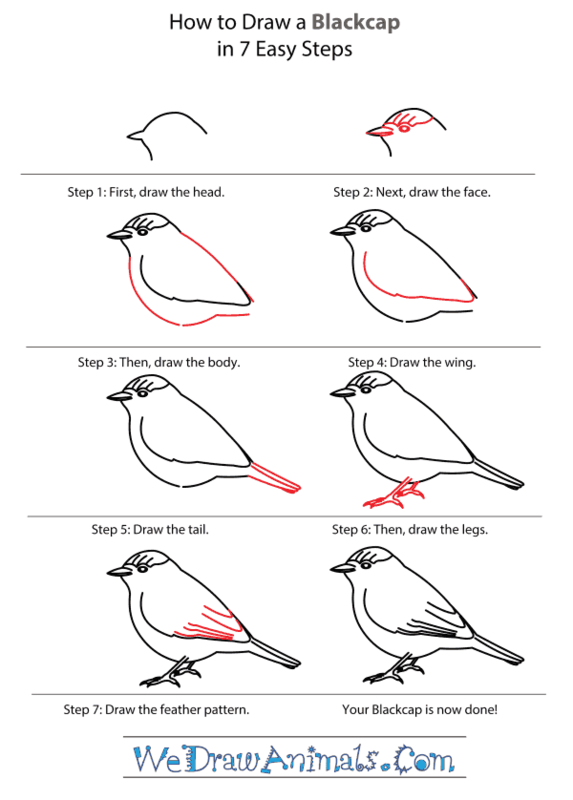 Draw the leg furthest from you much shorter than the first leg and attach it slightly closer to the back of the bird than the first. The blackcap (Sylvia atricapilla), or Eurasian blackcap, is a common warbler. It is usually olive grey on top and light grey on its belly. Males have a black looking cap on their head, while females have a reddish one. There are five subspecies of the blackcap, though they are all similar looking. They are found in most of Europe, western Asia and northwestern Africa, and they prefer to live in wooded areas. Fossils found in France indicate that the blackcap’s genus dates back 20 million years. Males who have bred before return to their same territory every year, usually in wooded areas with high perches and plenty of overgrowth. Males attract females with song, movements, and by building nests. The female builds the final nest where the eggs are laid, however, and both the male and female incubate the eggs. Lesson plan note: Music is important to both humans and birds, and the music of nature is often adopted into human culture. Discuss how humans and birds use music differently and similarly, and why it is important to both.